At the roots of all the modern and complex problems lies the materialistic, fragmented concept of the world and of man. An exclusive, ego - centered life - pattern is the prime cause for the disintegration of society, which in turn results in the destruction of the happiness of all. The solution, therefore, lies in expanding the awareness of one's self and Yoga is the art and science of ever more subtle self-awareness. 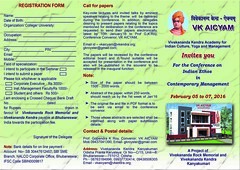 Vivekananda Kendra, through VK-AlCYAM, Bhubaneswar, will make its own contribution in the field of yoga and its application for holistic living and bringing harmony in the changing social dynamics. School and College Students, Teachers, Professionals, Youths and Young couples.